Buy TO3000 3D through ProZ.com and SAVE! TO3000 is a software package that helps you overcome the challenges of translation management. •	can use templates to generate invoices, payments, etc. •	can use its built-in back-up and restore features to save a copy of their data and retrieve it if need be. With 5,257 licences of TO3000 sold to date, it’s the most popular accounting software around for freelance translators! TO3000 will save you time at every stage of your work; it will automate many manual operations for you and eliminate hundreds of routine operations. What’s more, it will provide you with a complete picture of your translation business. With Translation Office 3000 at your fingertips, you’ll be able to see all the information you ever need. You’ll consequently be able to plan your work better (and rest more peacefully as a result). Thanks to better planning, you’ll never miss a deadline again (and you won’t need to apologize for doing so either). You won’t need to worry about a job you forgot to do as TO3000 will always keep you on track. TO3000 is currently being used by 5,257 freelance translators worldwide. Translation Office 3000 helps translators track and manage their translation jobs, invoices, payments and, of course, their clients. This flexible tool has been created to help you organize most aspects of your work as a freelance translator in a simple way. 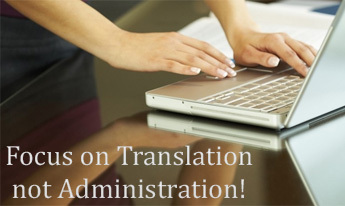 Automates your business routines and helps you focus on translation, not administration! When you buy this special software package, you’ll feel it was developed just for you – it will meet all your requirements. TO3000 allows you to manage jobs, invoices and payments easily. It saves you time and gives you a clear picture of your business situation as well. TO3000 is developed and supported by Advanced International Translations (AIT). AIT is a company that was founded in 1998 and has released many popular products for the translation idustry, including: Projetex, AnyCount, AnyMem, AnyLexic, ExactSpent. AIT is a proud member of GALA, ATA and ELIA. Thanks to outstanding work and progress, this company has earned the Microsoft Silver Partner and Premier Elite Intel Software Partner statuses. AIT is proud to provide fast and free technical support through live chat and AIThelp.com Help Center. AIT is currently the only company in the translation industry that offers live chat support. Searchable database where you can enter all important information about your clients: contacts, project managers, files, projects, jobs, marketing information, prices, quotes, invoices and payments. All data will be stored in one place and you will never need to waste time for unnecessarily searching. 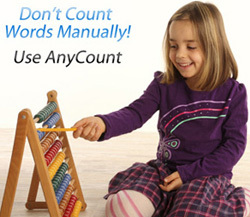 With the built-in AnyCount engine you will be able to count words, characters, and lines in files easily and efficiently. The text count engine will give you full word count results, allowing you to count text other programs miss. AnyCount even counts text in graphic PDFs, images, and scanned documents. You'll never forget a single invoice or payment with TO3000's invoicing and payments features. TO3000 allows you to keep on top of overdue invoices or completed jobs that have not yet been invoiced. What's more, discounts, taxes and different currencies are all supported. You can even use the built-in templates or create custom documents. TO3000 supports a variety of currencies; accounting is possible using multiple currencies, which are automatically converted into your base currency. Use existing reports or easily create whichever style of report you need to review the information. Reports will allow you to see the important information about your business and help manage it better. Create prices for each client and change them easily. You'll never again confuse the prices used for different clients. The backup feature allows you to keep a copy of all your important data, which can be vital when confronted with serious PC problems. Easy migration with the built-in importing and exporting tool allows you to import your existing client database in minutes! This program can complete multiple actions simultaneously. The rapid generation of numerous invoices, purchase orders and payments saves time and makes work easier. This translation management software is extremely flexible. User-defined fields and variables enable the customization of numerous parts of the program, allowing you to create a user interface that will look like it was developed especially for your translation business. We use a unicode based system, meaning you can use any needed symbols, including: kanji, hieroglyphs, mathematic symbols, Greek, Latin, and Cyrillic alphabet. TO3000's intuitive interface means little time is required to adjust; you can start using it right away. Efficient time tracking software that enables you to calculate the exact time you spent on a particular job. You can track multiple jobs for multiple clients in a single place. (Valued at EUR19.) Included in Purchase! Need glossaries? Benefit with AnyLexic. Easily create and edit multiple glossaries and dictionaries. Monolingual, bilingual, or multi- language. Search terminology definition in multiple glossaries from any program or document. (Valued at EUR49.) Included in Purchase! Please be advised that license activation may take up to 72 hours. TO3000 will be one of the most profitable investments of your freelance translator career. 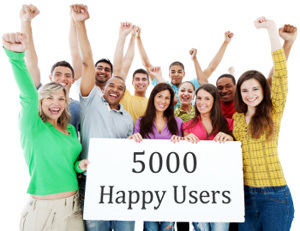 "I have been using TO3000 for the last couple of days and must say that I am very impressed. It is perfect for keeping my bookkeeping straight. I just wish that I had started using this a couple of years ago!" "Once again, thank you for your friendly, quick and useful support! I am still your biggest fan!" "Translation Office 3000 is a good choice for freelancers who have to juggle several projects at once or small translation companies in a similar position." "Translation Office 3000 is worth its weight in platinum! Thanks to it, my bookkeeping gave up being a nightmare and a mess and I never missed to send invoices in time (so being paid as timely as possible). Furthermore, the support is at First Class level. And after many years using it, my opinion isn't changed. Two thumbs up, AGAIN!" "I'd like to tell you how impressed I am with your software." "I am highly satisfied with TO3000, and wish to congratulate you for your efforts and hard work. I use this program regularly, and find it highly configurable and effective. My wife (also a translator who used to work for one of the major translation agencies in Athens) also uses it for her projects, and with her extensive experience in project management she has had nothing but praise! Trust me, it's great! " "I have been waiting for this tool for such a long time! With estimates, invoices, and analysis all integrated in one tool, you will never miss any opportunities! If you are a translator, this is worth trying! Easily the best find of the year." "I can't tell you how much this program has made my life so much easier. I promote it whenever possible."